Grilling is a very popular venue among caterers and chefs who are seeking ways to satisfy the taste palates of a wide range of clientele. Grilled foods offer an exciting variety of foods that are healthy, tasty and allow for introducing creativity and diversity into any menu plan. At TigerChef we have all the grilling equipment you need to make the grilling experience at catered events, tournaments, college campuses, restaurants and even your own backyard, a terrific one. Grilled foods include main dishes, side dishes and exotic grilled desserts. Grilled foods can be marinated in numerous types of sauces and marinades; they can be grilled in aluminum foil or over direct radiant heat or indirect heat; they can be smoked and then grilled for a rich, robust flavor. The variety is endless; the grilling choices exciting; the menu options, out of this world. 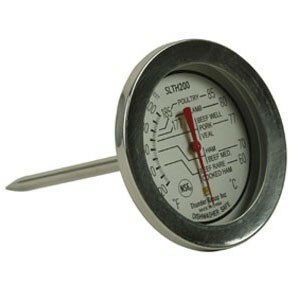 When working with meat for the bbq or grill, it is important to be aware of the temperature of both the grill surface and the grilled meat, much the same way as with conventional cooking. As opposed to checking the temperature of the grill by placing your hand above the grill, or by visually checking the meat to guess its readiness, a professional grill chef will want to have the most sophisticated equipment available to do the job. 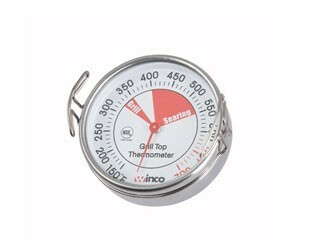 A grill thermometer and a meat thermometer can adequately check the temperature of the grilled surface and the grilled meat. This method will ensure prevention of foodborne illness resulting in undercooked foods. Preheat the grill 15 to 25 minutes before you start cooking to make sure the grill reaches the desired temperature and to kill bacteria that may have formed on the grill. For high heat, the grill should be 400-450°F, for medium-high heat 350-400°F, for medium heat 300-350°F and for low heat, including warming and holding, 250-300°F. A properly heated grill will sear foods on contact, keep the inside of the meat moist and help prevent sticking. An important note is that it is easier to remove debris when the grill is hot. So after preheating the grill, use a long-handled wire grill brush on the grill rack to clean off charred debris from previously cooked foods. If your restaurant or catering operation offers grilled meat, you can choose from numerous grill recipes that feature popular marinades and sauces. Marinating does more than infuse food with flavor; it also inhibits the formation of potentially carcinogenic HCAs (heterocyclic amines) which form when grilling meat or fish. According to the American Institute for Cancer Research (AICR), marinating can reduce HCA formation by as much as 92 to 99 percent. Working with meats and marinades must be handled properly in order to help avoid foodborne illness. Avoid cross-contamination by using separate cutting boards, utensils and platters for raw and cooked foods; refrigerate foods while marinating; and never baste with the marinating liquid. 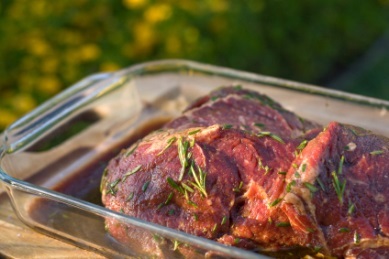 Store marinades in plastic or glass food storage containers and make sure that you have extra marinade just for basting, or boil your marinating liquid first in order to prevent bacteria from forming. Ensuring that your food is kept adequately refrigerated prior to cooking and after cooking is another important part of grilling meats. 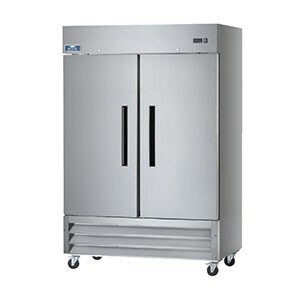 The danger zone for foodborne illnesses is between 40° F- 135°F so you will want to refrigerate perishable foods within an hour or two after grilling. If you are grilling large amounts of meat, you can precook the meat and then either keep it in a holding setting on the grill or reheat it in on the indirect heat zone of the grill before plating. Once cooked, let finished meats rest on a clean platter, tented with foil for about 10 minutes before carving so juices can redistribute evenly. Grilled vegetables are very popular side dishes that can gracefully accompany any grilled main dish. Not only are grilled vegetables healthy, but they are bolder and tastier than steamed or boiled vegetables, making them a perfect grill menu side dish option. Vegetables are also more cost effective than meat, so preparing large amounts of grilled vegetables to accompany any main dish, can greatly reduce the amount of meat required for any menu item. A lot of vegetables are successful on the grill, but the ones that are real winners are easy to prepare and always come out tasty. Such picks are corn on the cob, peppers, onions, eggplant, tomatoes and mushrooms. 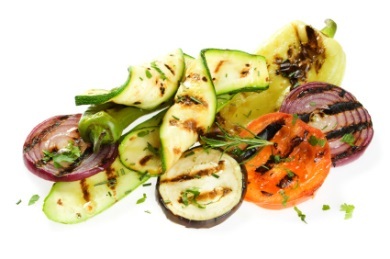 When these vegetables are grilled, they exude a terrific flavor that everyone loves. Looking to a more sophisticated vegetable, the asparagus does very well when marinated and grilled. When preparing veggies for grilling it is best to cut them into pieces that will cook quickly and evenly. The vegetables should be of consistent thickness and no more than about 3/4 to 1 inch thick so they look uniform and attractive. 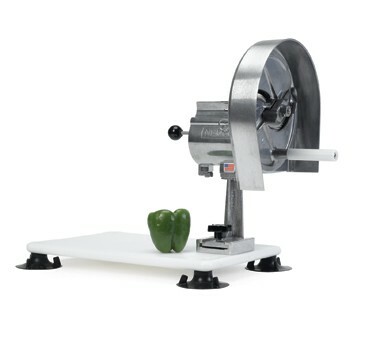 Vegetable slicers are a great help in food prep for cutting large amounts of vegetables in seconds. Once the vegetables are cut, soak them in cold water or marinate them for about 30 minutes before putting them on the grill. This keeps them from drying out. Then pat them dry and then brush lightly with oil to prevent them from sticking. For added flavor, sprinkle the vegetables with fresh herbs. 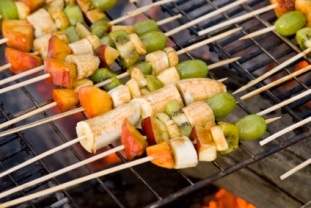 Smaller vegetables, like cherry tomatoes or sliced veggies, work best when strung on skewers and formed into kabobs. You can also wrap vegetables in heavy duty foil, although cooking in foil tends to reduce the tasty smoked flavor of the grill. Grilling times vary among vegetables, but they since they are more delicate than meat you will have to watch them closely so they don’t overcook. A kitchen timer can be very helpful in helping you keep track of cooking times. Another grilling option is to put the vegetables into a grilling basket which gives them a delicious grilled taste while keeping them out of the fire. To top off any great grilled meal at your event, tear off some foil and get your bbq tongs ready. Your grill chef will have a picnic choosing fun and innovative dessert recipes for the grill. Chefs have been turning to desserts that are extremely diverse, appealing, healthy and require use of the same grill surface for making terrific grilled desserts. Desserts such as grilled peaches with berries, fruit and cake kabobs, warm banana boats with lots of toppings and so much more, have made grilled desserts an extremely popular dessert item. When grilling desserts you can use frozen cakes by grilling them and adding fruits and ice cream. Popular desserts also include grilled pineapples, fruit kabobs and more. All you will need are sweet marinades, fruits, skewers, an array of dessert dishes and a vivid imagination to serve your guests delectable desserts that are unsurpassed by the greatest chefs around. From traditional to out-of-the-box, there are limitless possibilities for the commercial griller to explore on the grilling horizon. Grilled meats, vegetables and desserts, used with an array of marinades, are just a mere sampling of the endless variety of delicacies available on the grill menu. At TigerChef you can find all the grilling equipment, including commercial grills, bbq tools, dinnerware, utensils, tableware and serveware to make grilling a most profitable and winning food venue for your food establishment.